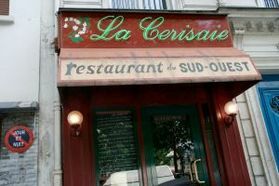 Co. and I walked into a telephone booth last Friday night and found La Cerisaie, a much-praised traditional French Southwest bistro, snugly situated in the shadow of the Montparnasse tower. 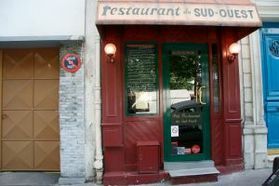 I've often lamented about the various size-challenged Parisian eateries I've reviewed here, but it goes with the territory. Paris real estate is expensive and at a premium - you take what you can get. But for La Cerisaie's space, a 'no thanks' might have been more appropriate for the proprietors, chef Cyril Lalanne and his wife, the latter of whom was literally breathing down my neck throughout the entire meal as she maneuvered her way towards the diners to my left. And that's all too bad, because we could never get very comfortable, however deeply we delved into the 2007 Corbiere (29€) and however pleasant the demeanor of Mme Lalanne. And when you're not comfortable, you find that you're not paying much attention to the food. At any rate, the regularly changing blackboard menu consisted of about 5 offerings each of 9€ entrees, 15-20€ plates, and 9€ desserts. Everything was very Southwest and decently prepared, with Co. opting for the starter of soupe froid de petit pois et jambon arieges, while I went with the saumon mousse, the latter a rare concoction that provided a nice little puddle for the bread. I rather enjoyed my main dish, a magret d'oie et poivre roti aux epice, several slices of goose enhanced by the peppery flavor; Co. was less enthusiastic about her couchon noir de bigorre avec asperges blancs. Jesus, black pig? There should be a law. As Co. plied workmanlike through her poelee de frais gariguettes et glace nouget, I was pretty much knocked out by what to the eye looked like a rather ordinary slice of tarte fondante au chocolate accompanied by a scoop of glace cafe. Taste-wise, however, wow. The sweet blend of chocolate and coffee left a tinge of salt on the palette. Definite highlight of the evening. In short, our experience at La Cerisaie didn't soar to the heights suggested by the raves I came across prior to reserving, particularly in two of my favorite restaurant resources, Le Fooding and A. Lobrano's Hungry for Paris. If you're just emerging out of the Montparnasse station with a healthy hunger for authentic Southwestern cooking and don't want to walk far, La Cerisaie might be just the ticket. Of course, you best be sure to reserve beforehand, otherwise, no way Jose. (You have two choices - 7:30 and 9:30 p.m.) Unless there is an expansion in the offing, I won't be returning, however. I have enough of spending two hours feeling like I'm in somebody's way. When asked by a patron at the next table why she doesn't find a larger space, Mme Lalande admitted that a larger venue would be too much work, reflecting the desire to keep La Cerisaie a basic mom & pop's organization.